My short story “Moe’s Seafood House” appeared in the #4 issue of Black Cat Mystery Magazine. Black Cat Mystery Magazine is published by the Wildside Press. My flash fiction piece, TATS, appeared in the Fall, 2018, issue of Parhelion Literary Magazine. INTO THE WOODS is a collection of short stories, essays, poetry, guided meditation, and original music, put together by the Mindful Writers Retreat Writers of western Pennsylvania. I had the honor of editing this collection as well as contributing a short story and a prose poem. All proceeds from the anthology benefit the Children’s Heart Foundation. Not my credit, but I am quoted in columnist (and my friend) Steven Petrow’s essay, “Am I Too Old For a Mid-Life Crisis?” in the Washington Post. My short story, “Voices,” appeared in the Summer 2017 issue of Philadelphia Stories. “Voices” was nominated for a 2017 Pushcart Prize. “I’m Sick of Being Invisible” is a personal essay published in the online journal Better After 50: Real Women, Real Stories. 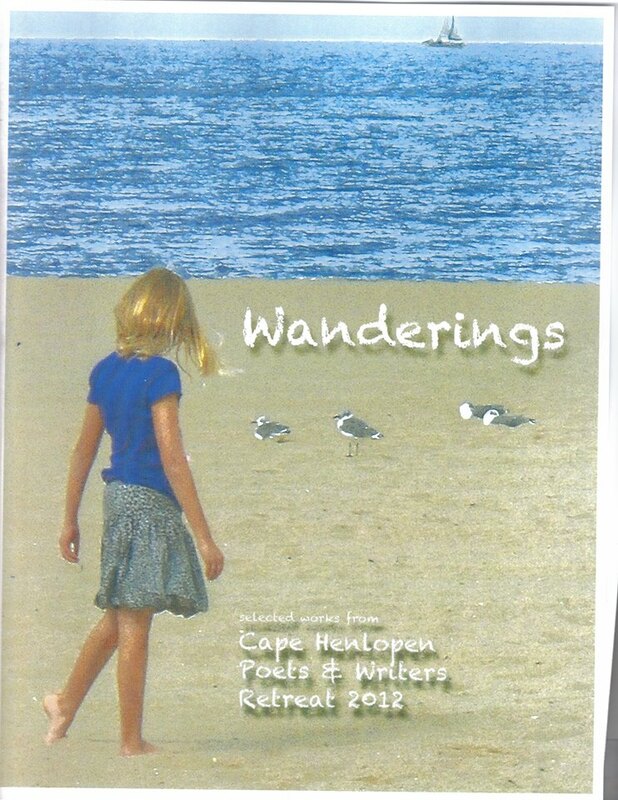 CURRENTS: Selected Poetry & Prose from the 2012 Cape Henlopen Retreat Writers – My story “Manhunt” appears with stories and poetry from some of Delaware’s best working writers. My author interview with Delaware author Cindy Callaghan, creator of the middle grade novel Just Add Magic and follow-ups Lost in London, Lucky Me, Lost in Paris, and Lost in Rome, appeared in the 28th edition of Writers Digest’s Children’s Writer’s & Illustrator’s Market, 2016. My flash fiction piece, “What I Don’t Know About Nature” appeared in the Winter 2015 issues of The Fox Chase Review, a Philadelphia-based literary journal and sponsor of the The Fox Chase Reading Series. The Review is published three times a year, online, so that poets and writers may reach a broad audience with their work. Literary Mama, the award winning online journal for the maternally inclined, publishes a blog, After Page One, that presents advice, encouragement, and inspiration to mothers who write. My guest post “What in the World in a Sprint Journal?” explains how my failed attempts at keeping a diary or journal changed when I began writing an hour every morning. Extraordinary Gifts: Remarkable Women of the Delaware Valley pairs writers and visual artists to pay tribute to 20 exceptional women with Philadelphia connections. The women honored include Marian Anderson, Louisa May Alcott, Mary Cassatt and Margaret Mead, and the women artists, writers, and poets honoring them are all part of the contemporary Philadelphia arts scene. I had the honor of writing about environmental activist Dorothy P. Miller, who continues to fight to preserve habitats along White Clay Creek in Delaware. 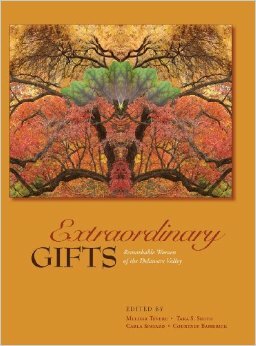 Extraordinary Gifts was created and published by Philadelphia Stories, a non profit literary magazine that publishes the finest literary fiction, poetry and art from Pennsylvania, New Jersey, and Delaware and distributes free of charge to a wide demographic throughout the region. In September of 2012, 18 writers attended the Delaware Division of the Arts’ Cape Henlopen Retreat for three days of writing, bonding, and working with a leader on various guided exercises. The 8 poets were mentored by Delaware’s poet laureate, JoAnn Balingit. The 8 prose writers were mentored by novelist and instructor Alice Elliot Dark. The result of the retreat was WANDERINGS, a collection of prose and poetry written during the retreat. My short piece, “Deadheading Day,” grew from a short few paragraphs in my novel in progress, to the full but short piece published in the collection. My creative nonfiction piece, “Three Hots and a Cot,” appeared in the Winter/Spring 2014 issue of Lunch Ticket, the literary journal of the MFA program at Antioch University, Los Angeles. Lunch Ticket’s focus is writing, art, and social justice. 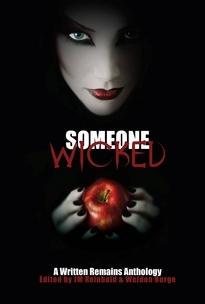 My short story, The Chances, appears in the SOMEONE WICKED anthology, published in November 2013 by Smart Rhino Publications. My author page appears on the Smart Rhino website. My creative nonfiction piece SUNDAY VISIT appeared in the online magazine Literary Mama on April 13, 2013. Literary Mama “features writing by mother writers about the complexities and many faces of motherhood. We publish book reviews, columns, creative nonfiction, fiction, poetry, and profiles of mother writers.” Literary Mama is one of Writer’s Digest’s 100 Best Websites for Writers. COOPERATION under the pen name R. D. Long, in the inaugural issue of TOSKA, a quarterly online literary magazine of non-fiction and photography. The issue was released June 15, 2012. My micro-fiction piece, COUNTDOWN, was included in an article celebrating April as National Poetry Month and highlighting a new open mic series offered by the Newark Arts Alliance. 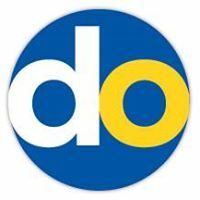 Delaware’s Poet Laureate JoAnn Balingit devoted her column in the News Journal to Newark Open Mic. I was pleased to be included in the piece, and to offer my work alongside poems by Beth Evans and Maria Masington. My short story TRAITEURS was published in the online literary journal 10kt0bi (Ten Thousand Tons of Black Ink) as the featured story in February, 2013. “Traiteurs” is the Cajun French word for healers. In this very short piece (<1,000 words), I wanted to create a small, quiet world with just a touch of woo-woo. ~ Fun interview in Southern Writers Magazine, January-February 2013 issue. In this piece, SWM editor Susan Reichert and I discuss how to find an independent editor; my particular process when working with clients; and how to build rapport and a beneficial author- editor relationship. ~ My memoir “Getting to Grand Isle” was published in the Fall 2012 issue of the Arkansas Review. My piece touched on childhood, beach erosion, and the influence of Kate Chopin. ~ My short story Evie was published in the online literary journal, Blue Lit in February, 2012. Blue Lit promotes the writing and reading of literary fiction. ~Dead Horse, Live Daddy – a short story based on my father’s bout of encephalitis – was published in June 2011, in Dew on the Kudzu. 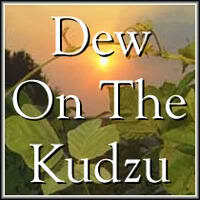 Dew on the Kudzu is an online ‘zine that celebrates the Southern Written Word. 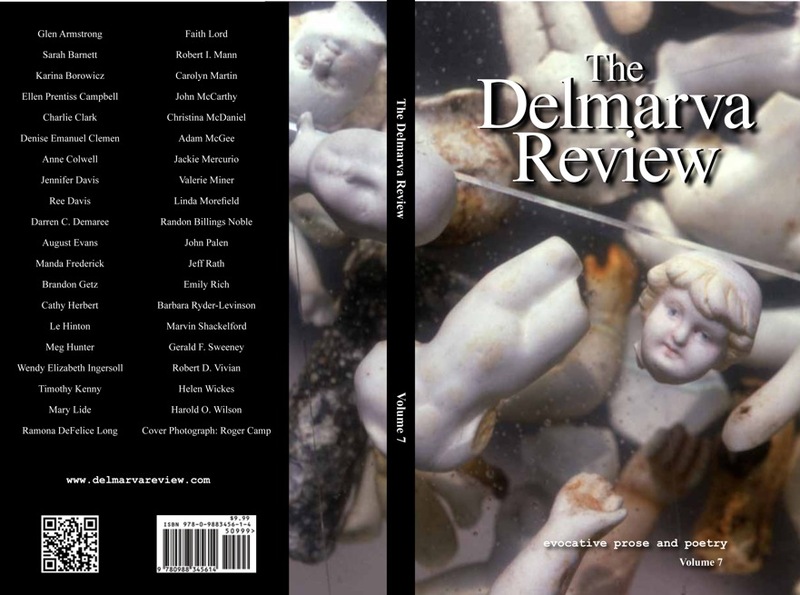 ~ My short story “Trust” was originally published in the March-April, 2008, issue of Delaware Beach Life magazine, in an issue featuring stories and poetry from the Writers at the Beach: Pure Sea Glass writing conference and contest. “Trust” was presented the Fiction Award at the conference. ~ My short story “At Sea” was included in Stories from the Ink Slingers: A Written Remains Anthology published in 2008, by Gryphonwood Press. ~ “Let Them Eat Cake” was originally published in Cricket Magazine (Carus Publishing), in February 2004. It is now available online, and in audio, through EBSCOhost. “Let Them Eat Cake” is a narrative biography of Marie Antoinette. ~ The FOSS Cure – an article outlining how to handle Fear Of Short Story, in the June 2011 issue of InSinC, the national publication of Sisters in Crime. ~ Five Questions (and Answers) about Independent Editors – an article in the March-April 2011 issue of The Penn Writer, the newsletter of Pennwriters. Pennwriters is a multi-genre writer’s organization based in Pennsylvania and beyond. ~ To Be, or Not To Be, An Active Writer – an article in the April, 2011, issue of FIRST DRAFT, the newsletter of the Sisters in Crime Guppy Chapter.